And there goes a first Falcom release. Falcom PC Engine games are famous for their redbook audio (CDDA tracks), which were most of the time handled by Ryo Yonemitsu. However, the music generated by the PCE itself remained, at that time, unavailable (game logs were made possible since then, though). Anyway, this archive consists of both the redbook tracks and the chiptunes. Great work niki! Thanks a lot! Oh yeah, and I wouldn’t personally call Reah as Lair, as that was only used in the TurboGrafx-CD version of the game and never anywhere else officially. You have two track names with the word “with” spelled differently. These are “Stay With Me Forever” and “Too Full with Love”. Hey MP83. Sorry I didnt see your comments earlier. They got list in the anti-spam filter. I’m pretty sure we talked in the past, probably on the VGM DC++ hub ? 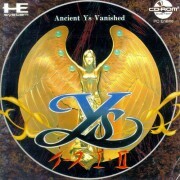 Not sure anymore aha, but I do remember you being passionate about proper Ys translations.